Thursday, 1 December 2016, A paramedic who made headlines after wading through floodwater and breaking burglar bars with his bare hands in order to save five children, four women and a dog, has been named Netcare 911’s Carer of the Year. “At Netcare 911, care is at the centre of everything we stand for, which is why the Netcare 911 Carer of the Year awards is a very special event for us. The nominees are individuals who have stood out for going beyond the call of duty to care for members of the public who are in need of a helping hand,” explains Craig Grindell, Netcare 911’s chief operating officer. 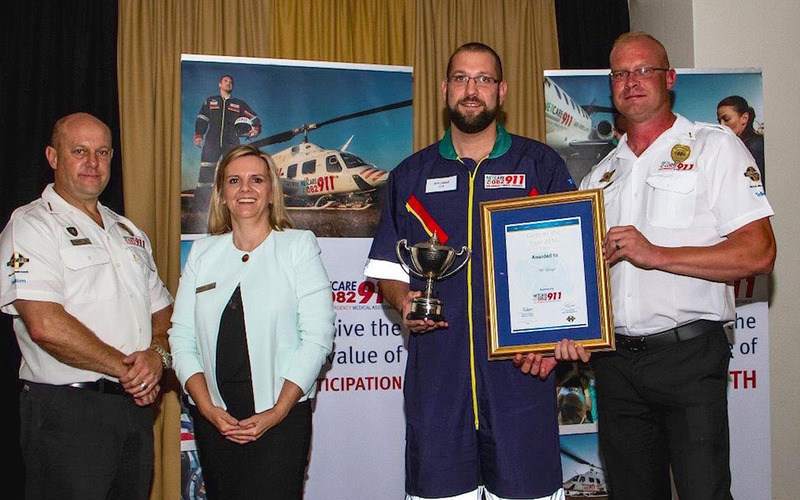 “Each year Netcare 911 calls for nominations to acknowledge staff members who have demonstrated the company ethos of exceptional care in often extremely difficult circumstances. This year’s nominees each showed their care through making a meaningful difference in the lives of others. On that day, Avi had attended to people who were in a motor vehicle accident and was on his way back to the Netcare 911 base, when his progress was blocked by a number of flooded roads. He noticed a man who appeared distressed and immediately asked whether he could be of any assistance. The man explained that his wife and children were trapped in their home in a nearby complex. “With the help of another Good Samaritan, Avi rescued two women and a dog from the rising waters at one unit in the complex. A second house in the complex presented a more challenging scenario, as a woman and five children were trapped inside with no means of escape,” Grindell explains. Through a window, Avi reassured them that he was there to help them to safety. The floodwater was rising higher and higher, however, and time was of the essence. A floating piece of wood in the flood debris came to hand, and Avi used it to smash the glass of the window but the burglar bars still stood between him and the desperate family. Avi later recalled how a surge of pure adrenaline suddenly gave him the strength to break the burglar bars with his bare hands and assist the woman and children to safety. Finally, Avi rescued an elderly woman who was also in distress due to the sudden flooding. “Avi’s actions are indicative of true caring, and we applaud him for his bravery and tireless dedication to helping others. 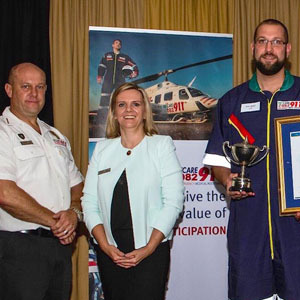 Our other Netcare 911 Carer of the Year nominees have all demonstrated their care for others in various ways, and we are proud of their service to society,” Grindell concludes. Basic life support paramedic, Baboh Hlabisa, who is based at Netcare 911’s base at Netcare The Bay Hospital in Richards Bay, was nominated for the outstanding care he showed when he came across an accident scene while driving to Durban on the N2 highway while off duty. Baboh had very limited resources but set to work immediately to make the scene secure and directed concerned bystanders as to how they could best help him to assist the people who had sustained injuries. He did everything possible to treat the injured, even improvising an airway-preserving device out of cardboard, and continued to assist even when the emergency medical services arrived. Advanced life support paramedic, Cindy Doncabe, based at Netcare 911’s base at Netcare Pholoso Hospital in Polokwane, earned her nomination for assisting an underprivileged young man to fulfil his dream of studying engineering. The young man first came to Cindy’s attention in 2013 when he was seeking piecework to earn money for his studies. Cindy helped him within her means, sometimes giving him some money and at other times simply sharing her lunch with him. This year the young man visited Cindy and again asked for money – this time in order to hire a graduation gown as he had completed his studies. Netcare 911 regional operations manager for the Free State, Graeme Ruder, was nominated for his efforts to continue the legacy of care begun by his late colleague and former Carer of the Year finalist, Maria Machogo. Before her death, Maria had collected donations for an underprivileged teenage boy with severe Down’s syndrome living with his grandmother. Sadly, Maria died not long after her kind and community-spirited gesture but her colleague Graeme was determined to continue her legacy of care. He initiated a charity drive, whereby the Netcare 911 Welkom base collected donations of food and money for the young man and his grandmother, and at the end of August, accompanied by Maria’s daughter, they delivered the goods to the family. Through Graeme’s caring gesture supported by his and Maria’s colleagues, her memory will live on and make a difference in the lives of others. “Netcare 911 management would like to thank each of the nominees for inspiring all of us to new heights of caring. Each of us has the potential to make a meaningful impact if we recognise such opportunities and act upon them. Whether these gestures are great or small, collectively they can make a significant impression on society,” Grindell concluded.